Sally teased the soft texture of the ribbon between her thumb and her forefinger, the faded silk trailing between her fingers. Dropping the bundle on the coffee table as if touching it would burn her hands; she sat back on the sofa, chewing on her lip. The bundle of letters like a beacon flashing on and off. Although it wasn’t a coffee table at all, it was an old leather luggage trunk she’d found in the attic when she’d first moved in. She didn’t know where the trunk had come from or how long it had been up there. But when she’d found it, she’d fallen in love with it. She’d already spent months scouring the flea markets and charity shops for ‘classy chic’ which in reality meant ‘classy cheap’. So the old trunk had been perfect. It had always been locked, until today. This morning, after an other scavenger hunt in the attic, she found a carefully folded piece of white linen. 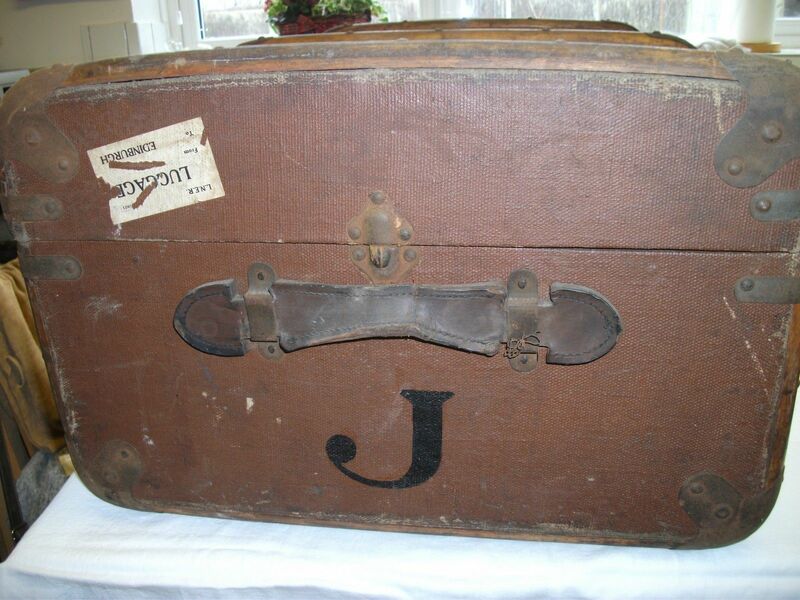 It was neatly folded, with a trail of tiny violets delicately stitched on the lower corner, and the initials J.W. She opened carefully and a small brass key had fallen onto her lap. She’d instantly known what the key was for. Back in the lounge she’d carefully placed the key in the lock of the trunk and turned; the expectant silence broken by a tiny click inside. She’d stilled. Opening the lid with a touch of trepidation, the excitement caught her breath, speeding it up and making her hands a little sweaty and unsteady. Inside the trunk, the lining had almost worn away exposing the dark oak framework. It looked empty. Then she spotted a bundle pressed tightly into the corner. She lifted it out. A stack of envelopes neatly tied with a faded silk ribbon. She felt a shudder, as though someone had just walked over her grave. She’d closed the lid quickly and sat back. Looking at the bundle, her curiosity going into overdrive she reached for her wine glass, downed the contents and picked up the bundle. Gingerly pulling the ribbon, loosening the knot, the silk floated to the floor. The first envelope had a worn red stamp in the left hand corner ‘Return to Sender’, the same faded stamp was on each one. Pulling her feet up onto the sofa, she tucked her legs underneath and opened the first envelope. By the colour of the fading paper and the dry texture under her fingers she knew they were old. The ink was pale but still readable, a smooth blue tip swirling across the paper. Another guess told her female, something about the flow and the care of the pen stroke. She looked for a signature at the bottom of the page. ……. ‘Mark’, well that was a little unexpected. Sally gripped the letter in her hand, her eyes instantly pulled from the page to the photo frame on the wall. It was her graduation one, mum looking radiant and dad grinning like a peacock. The three Musketeers he’d called them, a cliché, but that was dad to a tee. Her parents had been so thrilled when she came along that the feeling never left them. After years of struggling to conceive and then dad’s illness, they never thought they would be able to adopt. But Sally had been offered to them when she was 4 months old and her dad had been smiling ever since. Jesus, he writes so impersonally. This guy was writing to his mother. Surely there should be something more. She’d always felt so secure in who she was that she’d never given any thought to her own background. It had never been an issue. Sure, she knew she was adopted; Mum and Dad had never kept it a secret, but it never left an after taste or a yearning to know more. “If you are the Julia Wade I am looking for, please send a reply to the address above. I implore you to acknowledge your receipt of this letter and hope we can meet in person at your earliest convenience. Sally put the letter down, unfolded her legs and made a pit stop to the kitchen. Instead of refilling the glass she grabbed the bottle and brought it back with her. Habit made her check her phone. Two texts from Simon. She stopped, thought about answering but then looked back at the letters and changed her mind. Instead she switched off the phone, threw it in her bag and swallowed another mouthful of wine. She didn’t have the energy to deal with Simon tonight. She sat back on the sofa, picked up the second envelope and opened it. What happened, I waited under the clock at the station. Why didn’t you come? If Julia was his mother, why didn’t she go, how could she leave him standing there, waiting? Three hours watching trains come in, then go out, people rushing past, never stopping. The first letter was so formal, but this one seemed more personal, there was pain in his words, she could feel it. Although they were strangers Sally felt strangely drawn to their story. She sat back, closing her eyes, picturing the woman who never arrived. The deafening sound of the roof collapsing drowned out the screams from the others in the shelter. A ball of fire whooshed upwards as concrete and tiles rained down on the crowd. Nineteen year old Julia Melling, knelt against the wall, her eyes tightly shut and her hands pressed against her ears. The noise was painful. Coughing and brushing debris from her hair, she looked up to find two men looming over her. Their mouths were moving but she couldn’t hear what they were saying. They lent in closer, their mouths still moving but their voices couldn’t penetrate the deafness in her ears. She groped unsteadily behind her trying to re-orientate herself in the dimness. A third man came forward, past the other two and put an arm around her waist, lifting her up, away from the wall. The noise in her ears started to fade and she heard him call out to the other two men. “We gotta get outta here Mick, grab the bags and meet me back at Joes” The other two men nodded, darted a look at each other and gestured to Julia. “She’s hurt, I’ll just make sure the A.R.P’s get her, I’ll catch you up” The force of his voice enough to get the other two moving and climbing over debris a second later, although she noticed a look pass between them. Lifting her, he half dragged, half propelled her over the scattered brick work and out into the street. Julia looked up at the darkened sky, angry and red above the fires blazing all around. There was a shroud of what looked like pink smoke, and now and again through a hole in the pink veil an absurdly, reassuring evening star. Her eyes finally catching up with her brain. She looked at the dark haired stranger at her side, and quickly tried to step back. “Thank you, I’m fine now, you can remove your arm” she raised her eyebrow expectantly, waiting for him to immediately let go. He didn’t.